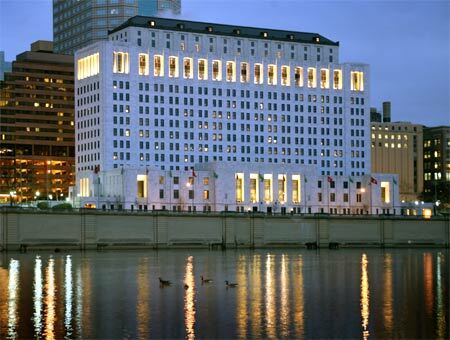 The Supreme Court of Ohio recently moved into their "new" office building located just south of Broad Street along the Scioto River. 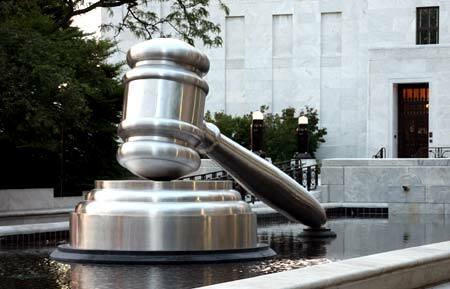 The Supreme Court is the highest court in Ohio. Althought the Supreme Court is now in a new location, the building is not. It was completed in 1933. 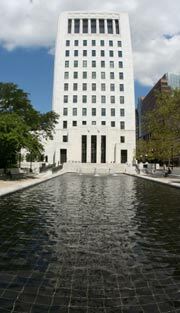 Originally called the Ohio Departments Building, over the years the building has housed various departments of state government, even the Ohio House of Representatives during the Statehouse renovation in the 1990s. Renovation involved a complete restoration of the building's Grand Concourse and the original hearing rooms — the largest serving as the main Courtroom. What was the State Library has been converted to the Supreme Court Law Library. In addition, the building includes an education center, flexible meeting rooms and adequate office space. 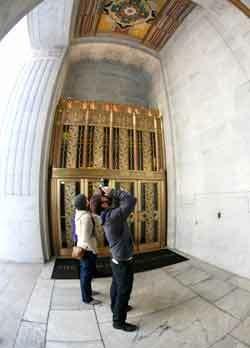 Hundreds of artists and craftsmen contributed to restoring the art deco building. 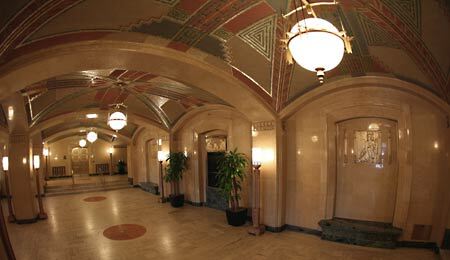 There are many different artistic styles found throughout the building, including 61 murals. The renovation was completed in 2004. The Build Ohio 2004 Award - Specialty Contractors, a warded to TP Mechanical contractors by the Associated General Contractors of Ohio. 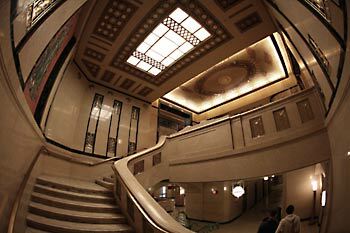 On the 1st floor, the Grand Concourse features marble-lined walls, travertine floors and bronze bas-relief plaques honoring 19 Ohioans who made their mark on the national scene. They include Ohio's 8 presidents, 9 justices of the United States Supreme Court and 2 speakers of the House of Representatives. The plaques are spaced between large pilasters of dark green Italian marble. 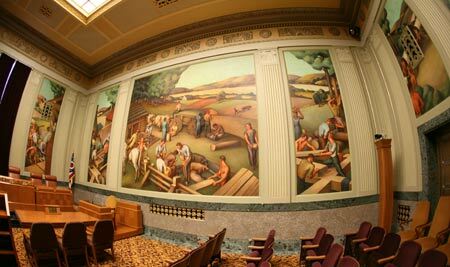 The 11 murals in the North Hearing Room reflect the style of pulic art known as American Realism, popular in the 1930s & 40s. 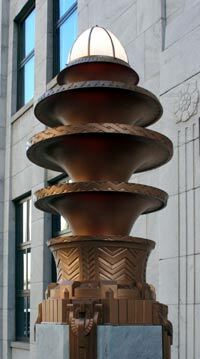 They feature scenes depicting the progress of industry in Ohio. The murals, created by Cincinnati artist John Holmer (1894-1962), feature industrial and agricultural workers and are divided between scenes of Ohio labor and modern work. Originally designed for use by the Industrial Commission for hearings related to workers compensation and other issues, the North Hearing Room is now primarily used by the Board of Commissioners on Grievances and Discipline. The storybook murals in the South Hearing room show the important role of the different means of transportation in the development and growth of Ohio Ohio commerce. 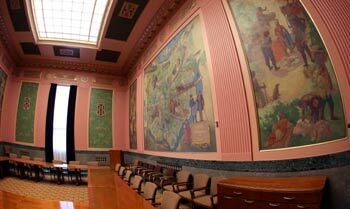 Appointed with walnut and marble, and bold and muted murals, the Courtroom conveys purpose and sense of Ohio's history. The ornate room features nearly 50 murals depicting everything from the five states created from the Northwest Territory to the settlement of Marietta in 1788. The largest and most ornately decorated room in the Ohio Judicial Center, the Courtroom is where the Chief Justice and Justices of the Supreme Court hear oral arguments. Ohio's American Indian culture is depicted with bronze bas-reliefs of historic Ohio Indian leaders Logan, Little Turtle, Pontiac and Tecumseh. Mosaic tiles create patterns on the ceilings featuring Native American language symbols. There are also chevron etched lamp globes suspended from the ceiling with bows and arrows. The iron grills on the doors incorporate metal silhouettes of designs by the pre-historic Hopewell Indians and historic groups in the Northwest Territory. Construction of the Ohio State Office Building is tangled in politics, labor disputes and tragedy. Debate stretched out for 17 years over the details of the new building that finally began construction in 1930. Disputes arose over non-union workers that included labor strikes. In 1932, just as construction was almost complete on the building, an gas explosion killed 10 workers and injured 50 others.